SellerDeck is the new name for the award winning range of Actinic desktop based software including Actinic Catalog and the Actinic Business range. The original Actinic name is now owned by Oxatis and is used to market the Actinic Online (Cloud) range of ecommerce solutions that Oxatis now supply. With over 5,000 live online shops and 16 years experience SellerDeck (formerly Actinic) has helped tens of thousands smaller companies start selling online. SellerDeck has become a general purpose supplier of applications and services to smaller retailers and wholesalers – primarily for ecommerce but also for in-store and telephone/mail order operations. The company has a range of ecommerce applications including web-based and desktop applications for start up and established businesses together with a range of products and services for web designers as well as EPOS solutions and is still based in Surrey with one of the Actinic co-founders at its helm. At Sit4 we have been providing Actinic based ecommerce solutions across the UK since 1999 and continue to do so. Site4 are fully trained and are accredited to sell the SellerDeck Catalog and Business range of ecommerce software. We are also a fully accredited Sage Accounts Partner and specialise in integrating the two packages. SellerDeck Catalog, SellerDeck Business, SellerDeck Business Plus and SellerDeck for Sage 50 Accounts software provide a complete business process, including off-line catalogue maintenance and the printing of invoices, outstanding orders and credit card schedules. Download a trial today! The SellerDeck software installs on your PC or local area network, so when your cloud services are interrupted, your business can keep running. Powered by a familiar Windows interface, it provides ease of use, flexibility and a comprehensive range of features in a value for money package with Start Up and Design Wizards to get you up and running quickly. It is also compatible with a wide range of web hosts and payment processors, including SellerDeck Payments and PayPal. SellerDeck Catalog 2013 shopping cart software includes everything you need to design, build and run a business web site and online shop for up to 20,000 products for selling direct to consumers. SellerDeck offers easy to install desktop based software with full ownership and no monthly rental charges - which are both features missing with many other products in the market. Download a SellerDeck 2013 trial today. The latest version, SellerDeck 2013 has been designed to improve the performance of your online shop and turn more browsers into buyers. After lots of research by the clever guys at SellerDeck the end result is a set of new features that will transform the experience of your online browsers and enable you to increase sales, improve efficiency and improve customer service. SellerDeck 2013 includes a range of new features including product filtering; dynamic product options and pricing, automated pagination, enhanced searching and a brand new server-side API. To find out more click here to go to the SellerDeck website. Includes a short video showing the new features and live demos. 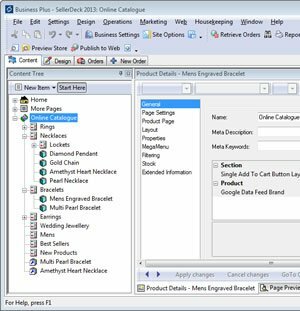 In SellerDeck 2013 they have added Ajax and an application programming interface (API) to make the customers experience as smooth as possible for the new filtering pages. This API can now be used by SellerDeck Developers to access the underlying product data from server-side applications and web clients. SellerDeck Catalog and the SellerDeck Business range of software also gives you a very welcome head start in promoting your site as they create search engine friendly static HTML pages - the importance of which cannot be underestimated. You can rename the directory that the Catalog sits in to whatever you want, so if you already have a website and want to keep pages that are already ranked and simply add them into SellerDeck you won't have to change the file path to these pages. SellerDeck also integrates with Google Analytics. SellerDeck Catalog allows you to have a a single product per page template so that you can build a catalogue quickly with one product per page which is very handy for helping you to get good rankings with Google and also popular with many customers. A further marketing benefit comes from the ability to up-sell to your customers as the software allows you to bundle products together. A previous version, v10 introduced a real time stock control function that works with SellerDeck EPOS Link and the MOTO (Mail Order/Telephone Order) to improve stock management and provide up-to-date information for retail businesses operating across multiple sales channels. With SellerDeck Catalog orders are downloaded securely to be processed and invoiced; reports for stock monitoring, back order management, picking lists and shipping can be generated. Shop updates are made easily in SellerDeck Catalog from your PC through a Windows interface and you only need to go online for the short time it takes to send up any changes helping to keep your phone bills to a minimum. SellerDeck Catalog offers support for unlimited depth of sections and sub-sections in your shop and provides support for product variants including attributes and components. Pop-up windows can also be also added to products to provide more information. SellerDeck also integrates with the design suite Dreamweaver, so you can tailor your online store to look and feel exactly how you wish. Ideal for those who don't intend to code in HTML/CSS, but still want to create more personalised sites. Alternatively at Site4 we can help you create a custom design for your online presence to match your existing branding. SellerDeck Catalog also includes a variety of business settings including a shop owner defined terms and conditions page allowing you to provide basic information to site visitors that you are required to do by law. Shipping is covered comprehensively in SellerDeck with calculations based on quantity, order value or weight the choice is up to you. Shipping values can be imported/exported to and from shipping tables so when the Royal Mail or your courier change their rates you can quickly update your charges. SellerDeck also allows you to include a separate handling charge. With regards to tax, calculations are made automatically in SellerDeck based on geography. SellerDeck Catalog also gives you the option to monitor the stock levels of products in your shop, and automatically mark products as out of stock which is useful for both you and your customers. An easy to use experience with high speed searching on text and price; a helpful site map showing the shop's structure for easy navigation; an editable shopping cart so they can add or remove items as they shop and a 'Remember me' option for customer contact details to save time on future visits. SellerDeck shops can present independent customer feedback on their site through a direct integration with a service provided by Feefo (additional subscription applies). Prospective shoppers can view feedback and opinions from previous customers on the service and/or products. The software has all the usual screen help files. Telephone technical support and software updates is available by purchasing SellerDeck Cover - details of which are covered below. A digital download option is included with SellerDeck Catalog which allows you to sell products such as images, pdf documents or music online in digital format. In short SellerDeck Catalog is simply the fastest, easiest most effective way to put your products on the web, and because it won't cost you the earth, you will still have plenty of marketing budget left over to spend on promoting your business. Unsure which SellerDeck software product you require? Click here for a simple tick chart comparison of the product features for the SellerDeck 2013 range of software. By upgrading to SellerDeck Catalog 2013 from the legacy versions of Actinic Catalog as well as taking advantage of the features added in SellerDeck 2013 already described further above you can also take advantage of previous additional features. Features added in Actinic v10 - Real-Time stock control, independent customer feedback (Feefo) and a streamlined checkout. Features added in Actinic v11 - Single use coupon codes, single product per page, online customer accounts and online order tracking/order history. If you want to upgrade to the latest version of the SellerDeck software from a previous version of Actinic (SellerDeck is the new name for the Actinic desktop range of ecommerce software) please contact us and we will be pleased to help. SellerDeck Business 2013 is a logical extension of SellerDeck Catalog 2013 and has been designed for businesses that require additional needs specific to the business to business market, advanced business to consumer features and in general to allow businesses to provide a better service to regular customers. SellerDeck Business software provides you with adavanced pricing and promotion options. You can help grow your sales by using smart promotional tools such as single and multiple use coupons, BOGOF offers, date expiring coupons and "Also Bought" lists. SellerDeck Business supports dynamic linking to external databases and spreadsheets. 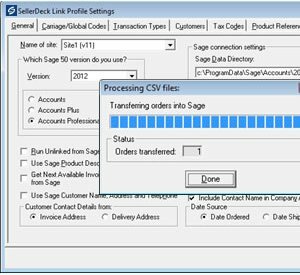 Note - if you require the link to Sage 50 Accounts you need to buy the new SellerDeck 2013 for Sage 50 Accounts which has all the functionality of the Business product plus the Sage 50 Accounts link module. SellerDeck Business also includes support for multiple channels and high volume order processing. As orders can come in from a range of channels including phone and mail the software includes the option to process offline orders easily using a dedicated screen for capturing offline orders and payments along with the related postcode validation option for offline orders and a desktop credit card payment option for offline orders (extra costs apply for the postcode and credit card services). SellerDeck for Sage 50 Accounts has all the features of SellerDeck Business plus a dedicated link application that provides the ability to export orders, customers, products and sections into Sage 50 Accounts, and imports your products, stock information and customers from Sage. The Sage 50 Accounts Link application saves you time and reduces errors by eliminating the need to re-key your internet shop orders or manually update your web catalogue. If you are interested in integrating your SellerDeck 2013 for Sage 50 Accounts with your Sage 50 Accounts software Site4 are a fully accredited Sage Accountant Partner and we have been supplying, installing and integrating the two packages for our customers for many years. Contact us for a quote today and see how we can help you streamline your business processes. As online businesses expand many site owners want to be able to create multiple sites and have multiple users for processing orders from multiple computers on a single network. This provides greater flexibility and enhances efficiency for very high volume sites. SellerDeck Business Plus has all the features of SellerDeck Business and also includes the ability to create multiple sites and add multiple users all with one Actinic licence. SellerDeck Business Plus also adds on the module to integrate to Sage 50 Accounts (which is also available in the new product SellerDeck 2013 for Sage 50 Accounts). SellerDeck Business Plus is the new name for what was previously called Actinic Business Plus. In Actinic version 8 there also used to be a product called Actinic Business Multi Site that allowed you to create multiple sites but only with 1 user, and if you wanted to add extra users you had to upgrade to Actinic Business Multi User. The wise bods at Actinic before the name change to SellerDeck simplified it so now you simply buy SellerDeck Business Plus and choose how many users you want it for. Much easier. Note: The base price for SellerDeck Business Plus is for 1 user only. Maximum number of allowable users is 4. For more than 1 users an extra charge applies. SellerDeck Cover provides SellerDeck Catalog, SellerDeck Business, SellerDeck for Sage 50 Accounts and SellerDeck Business Plus software owners with priority access to their UK based support team via their technical support hot line, Monday to Friday, 9:0am to 5:00pm (GMT/BST) if you are using the current version of the software or its immediate predecessor. SellerDeck Cover provides SellerDeck Catalog, SellerDeck Business, SellerDeck for Sage 50 Accounts and SellerDeck Business Plus owners with priority access to their UK based support team via their technical support hot line, Monday to Friday, 9:0am to 5:00pm (GMT/BST) if you are using the current version of the software or its immediate predecessor. SellerDeck guarantees a fast track response for critical issues along a with guaranteed escalation procedure to their technical team. SellerDeck Cover provides upgrades and maintenance during the 12 month's period of cover. A regular email newsletter will inform you of all version upgrades and maintenance releases helping to ensure you benefit from new product features as they appear. 60 days emergency hosting is also included. If you are interested in buying SellerDeck Cover for your SellerDeck / Actinic software please contact us with your licence details for a quote. If you require a wider level of software and hardware support including on-site support by Site4 please contact us as we will be happy to quote you for this. To find out more about SellerDeck and implementing your own online shop contact Site4 and we will be happy to help. We have plenty of experience in setting up, installing and maintaining SellerDeck based e-commerce sites for our customers including helping to heavily customise templates to fit individual business requirements. As part of our one-stop e-commerce solution we can also provide you with SellerDeck friendly web hosting and assist you in promoting your SellerDeck site online. We can also assist with integrating your SellerDeck shop with existing back-office procedures including customer contact/management databases and accounting packages such as Sage 50 software. If you already have a copy of the SellerDeck software (or Actinic) and require SellerDeck hosting, SellerDeck Cover (technical support from SellerDeck) or an upgrade to the latest version of the SellerDeck software from a previous version of Actinic (SellerDeck is the new name for the Actinic desktop range of ecommerce software) please contact us and we will be pleased to help. To see an example of one business that we have helped set up on the web using SellerDeck / Actinic please see our case study section, or go straight to Harrisons Packaging online. Site4 have been also working closely with Group55 on their family of websites including - Group55, Pest Control Shop and Strikeback. Working together we have updated their Actinic websites including integrating SecPay an online payment service provider, overhauling old template designs, updating site content and redesigning sites from scratch. We have also integrated their various Actinic sites with Sage 50 Accounts Professional software as well as providing book-keeping services and management accounts services.